ASX 200 slips 20 to 6165. High 6185 Low 6155. Good volume. Narrow range. Iron ore slips as Vale opens a mine. Coal stocks undwer pressure on delays at Chinese ports. PTM sell down by the Neilsons. NAB +0.44% won’t close any regional branches until 21021. MMS +3.61% relief as pulls ECX plug. CUV -12.21% newsletter spoils party. JHG -0.73% ignores us completely. PTM -11.09% Kerr and his wife sell down. Now same price as IPO in 2007. LVT +12.22% partnership with Canadian Testfire Labs. FMG -6.74% Vale restarts a mine as cyclone heads towards Pilbara. NHC -14.14% thermal coal delays at ports. CTX -3.38% update fails to cheer. SIQ -3.61% not so smart after all. PME +2.75% continues to head higher. Thin volume. GOR +3.16% resumes the uptrend. MYO -unchanged – KKR says its the best and final bid. FLC +6.33% wins Egyptian desalination contract worth $20m. WTC -0.78% good bounce off lows after placement. Speculative Stock of the Day: Beam Communications (BCC) +14.48% – Company roadshow including briefing for MT newsletter. Volume increasing. Biggest Rises: SWM, CIA, CTD, AMI, SIG, Z1P and MMS. Biggest Falls: ECX, NUF, NHC, SM1, CUV and PTM. Nufarm (NUF) –23.92% First half underlying NPAT came in at ($11.5m) beating consensus of ($16m). Revenue beat estimates at $1.58bn vs expectations of $1.52bn. Adjusted EBITDA missed at $120.9m vs consensus $122.7m. As expected by most brokers, full-year EBITDA guidance was downgraded, now expected to be between $440m and $470m, a 12% cut to previous estimates. Interim dividend temporarily suspended. From Bayer: A court in the US has ruled that glyphosate was a substantial factor in a man’s non-Hodgkin’s lymphoma. It can now proceed to the second phase to determine damages and liability. One California man had a US$289m award reduced to US$78m last year. This is the second case to come to trial. Clover Corp (CLV) +6.19% Good results this morning. CLV is in the omega-3 business. Net Profit after Tax 1H FY2019 of $4.5m (1H 2018: $3.2m) an increase of 40%. This has some implications for other ASX listed companies. “The infant formula market has remained strong but cautious in the first half, while it waits for the Chinese regulators to finalise SAMR licensing and proposed legislation for formulation change. Overall demand has been maintained while manufacturers manage stock positions”. Blackmores (BKL) –1.78% Appoints Marcus Blackmore as interim CEO, he will replace Richard Henfrey. Henfrey’s resignation was previously reported, he will step down on March 29. McMillian Shakespeare (MMS) +3.61 Pulls out of the proposed merger with Eclipse (ECX) -55.97% following the company’s trading update, ECX reported a 42% fall in NPATA for the first 5 months of FY19. The Westpac–Melbourne Institute leading economic index was unchanged in February, after an upwardly revised 0.1% rise in January. Department of Jobs & Small Business Skilled Internet Job Vacancies down 0.9% for the month in February. The coalition will cut its official immigration numbers by 15% to 160,000. 23,000 people will need to live and work in regional Australia for three years before being able to access permanent residence. There are an estimated 47,000 job vacancies outside the capital cities. A recent survey from the Lowy Institute found 54% of Australians think the total number of migrants coming to Australia each year is too high, while 30% said it’s adequate and 14% too low. Assistant RBA governor Michele Bullock has suggested that there is elevated risks from apartments but these risks are contained. The main concern is from a financial stability perspective if a large supply hits the market and further weakens an already under pressure apartment market. 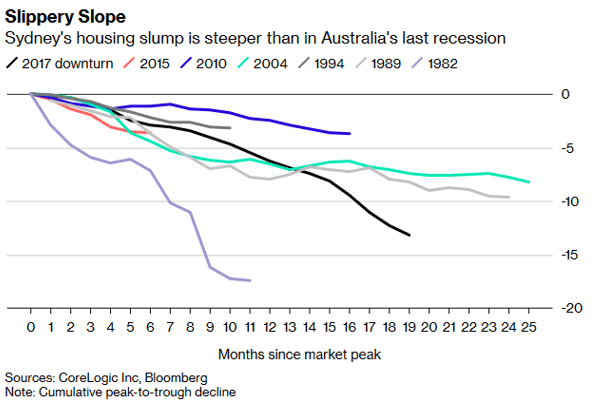 The housing slippery slope. Nissan has cut its Dongfang JV car numbers by 8% by 2022 in China. Passenger car sales fell 6% in China last year. Drivers in China buy one of every two EVs sold globally, and every manufacturer there must meet strict output targets for new-energy vehicles. Google is overhauling its search results algo to avoid an EU probe. Vale has reopened its Brucutu Mine in Brazil. Google is pushing into the streaming games market. Lyft IPO oversubscribed within two days. Inmarsat, the British satellite communications group, is considering a US$3.3bn takeover bid from an investor group led by buyout firms Apax and Warburg Pincus. Are we sick of Brexit? The EU is and is taking a harder line on proposed delays. Remember all 27 countries need to agree. Then the UK will get to vote for its own Euro MPs in May, just to rub salt into the wounds of the Brexiteers. UK unemployment has fallen to its lowest level in 44 years. Employment up 220k in the three months to January almost double forecasts. More than 32.7m people now in work in the UK. Unemployment fell to 3.9%, the first time it has dipped below 4% since the start of 1975. An additional 118,000 over-50s are in work compared with the previous three months. Of those 44,000 are over 65.